Training Course Dates Now Available For 2019. We are pleased to announce the release of our 2019 training course programme. 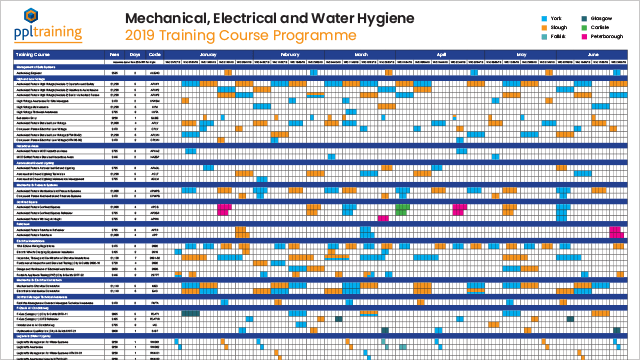 Our latest programme features our most popular open courses in the areas of Mechanical and Electrical Safe Systems of Work, Technical, Legionella (Water Hygiene), and Multi-skilling. These course dates are available across the UK at our well established training centres in York and Slough or at our training venues in Glasgow, Falkirk, Carlisle and Peterborough. Further to our open course programme, we can also provide bespoke and on-site training events, which can be delivered on request across the UK and overseas. Request a Hard Copy - Call 0333 121 1215 or email info@ppltraining.co.uk. View our Related Training Course Brochures. View our Service Feedback Below.